Planning out your Thanksgiving in advance can help to make it a success! Hosting any kind of gathering is stressful but hosting a dinner party is even more difficult in an apartment. So let’s talk about the best way to plan out your Thanksgiving Day dinner party! It is important to know who is coming to your home on Thanksgiving before planning out your day. Try to get as many confirmations as possible so you can arrange the food and furniture. It is better to have too much room and food than to not have enough so if a guest says they will “let you know”, plan for them to come anyway. Inviting your neighbors can also be a great way of giving you a sense of community! Let’s face it, Thanksgiving is about being around people and eating a delicious dinner. The first step to making your feast a success is choosing the recipes. Make sure you read them carefully and pick them out several weeks in advance in order to have all the equipment and ingredients necessary to make the dish. Read the recipe several times to get a thorough understanding of what you will need to do. Try to find recipes that are simple yet tasty. Look for items you can make in the slow cooker or that will bake at the same temperature as your turkey. Remove all the clutter and unusable things from your kitchen. Clear off your countertops, table, cabinets, and even the top of the refrigerator to make sure you have enough space to keep all of your groceries before the big day. You should start to shopping as soon as the recipes are decided on and store the ingredients in the kitchen for safe keeping. You will need to clear the countertop of everything that won’t be used during the preparation. Stash the toaster oven and blender under the sink or in the closet. Don’t wait until the day of to prepare everything. Write out a timeline for the week leading up to what you will be doing. Write down going to the grocery store, cleaning your apartment, and decorating as well as cook times for dishes and things you can make ahead of time. Let’s face it, your kitchen is small and so is your oven. So prepping the night before is the best idea ever! Chop herbs and veggies and measure out all of your dry ingredients the night before and don’t forget to label the container or bag. As you make things, write down the time it went into the oven or on the stove and what time it should be finished, this will help you keep track of what timer belongs where. Furniture is tricky. You will need enough space for your guests to sit while still having the optimum conversational flow and mingling room. Remember that some of your guests may not want to sit all night while others will happily sit in the corner and talk. Make sure there is room for everyone to sit while still having enough space for people to stand if they want to. Have guests bring folding chairs and tables to make enough space for everyone or rent them from a local supply store. You will also need tables clothes for the tables and enough dinnerware and cups for everyone. We suggest disposable to save on cleaning up which you will be doing enough of while cooking. Make your life as easy as possible. Keep your prepping trash in a bowl on the counter to save from walking back and forth 50 times. 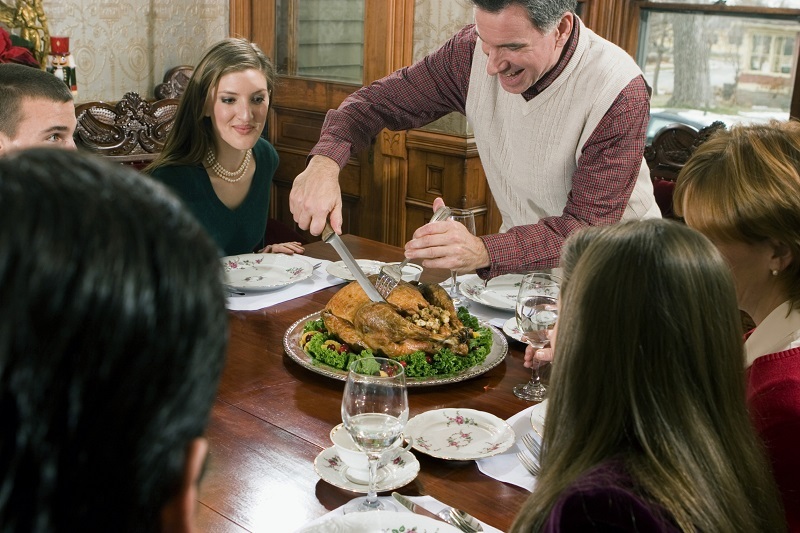 Ask guests to volunteer to pick up drinks, ice, and even side dishes if they can. Don’t forget to step out of the kitchen for air and some conversation before dinner. And the ever helpful appetizers will also go a long way with guests! This entry was posted on Friday, November 13th, 2015	at 8:36 pm	. Both comments and pings are currently closed.